Glenavon manager Gary Hamilton is preaching the virtues of patience and perseverance from his forwards entering a weekend test against Ards. 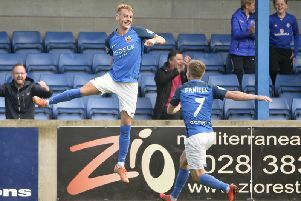 Defeat by 3-0 to defending Danske Bank Premiership champions Crusaders cost the Lurgan Blues top spot in the current table due to Linfield’s victory last weekend. Although Glenavon have a game in hand on the future fixture list, immediate cause for concern for Hamilton will centre on getting back on track at Mourneview Park this weekend after a three-match run without league success. Within that sequence of setbacks, Glenavon have found the net on just two occasions - a tally also matched by an Ards side set to visit Lurgan in search of a path off the bottom of the table. 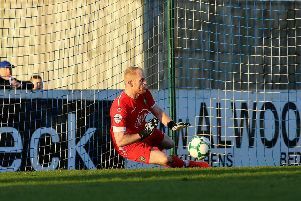 “Recently Ards got a win over Linfield and that has been a pattern this season, with results going against the league positions so we know to expect a difficult test,” said Hamilton. “The Crusaders match and in fact the three past games have been opportunities for our young defenders to learn lessons. “But we also know we need to get back to creating and putting away chances. “Mistakes by a goalkeeper or defenders tend to lead to goals but it is also important our attacking players do not suffer off a shortage of goals in recent weeks. “Ards will set up a stall to prove hard to beat so we must stay patient and find ways to create opportunities. “Plus always remember chances should arrive for the forward players and not to worry if one is missed. “It is about keeping on working and trying and having that self-belief. Kick-off on Saturday at Mourneview Park will be 3 o’clock against Ards. Glenavon meet Dungannon Swifts on Tuesday in the Euro Electrix Mid-Ulster Senior Cup semi-finals from 7.45 at Mourneview Park.